When LaShanda Korley was six years old, she stood at a blackboard, handed out papers, and gave her student — her grandmother — tests. She even logged the grades in a gradebook. “I’ve always known that I wanted to teach,” Korley recently told a roomful of the next generation of science and engineering professors. The Distinguished Associate Professor of Materials Science and Engineering with a joint appointment in chemical and biomolecular engineering at the University of Delaware, Korley credits several mentors for helping her get to where she is today — a professor and director of a five-year, $5.5 million NSF-funded project to explore bio-inspired materials and systems, such as nanocomposites inspired by spider silk and soft robotics inspired by the way worms wriggle. Now Korley is paying it forward as co-director of a workshop that grooms diverse leaders, including individuals from underrepresented groups, for futures as university faculty members. 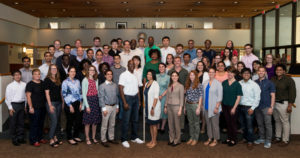 At the 2018 Future Faculty Workshop, held at UD from July 18 to 20, faculty members from 17 universities mentored senior graduate students and postdoctoral fellows from across the country who plan to pursue careers as independent academic researchers in chemistry, chemical engineering, materials science, and polymer science with a focus on soft materials and biomaterials. Through panels and breakout sessions, mentors offered advice on networking, preparing application materials for faculty positions, interviewing and negotiating, writing grants, maintaining work-life balance, and more. New this year was a spotlight on promoting student wellness and inclusivity led by the Center for Counseling and Student Development. 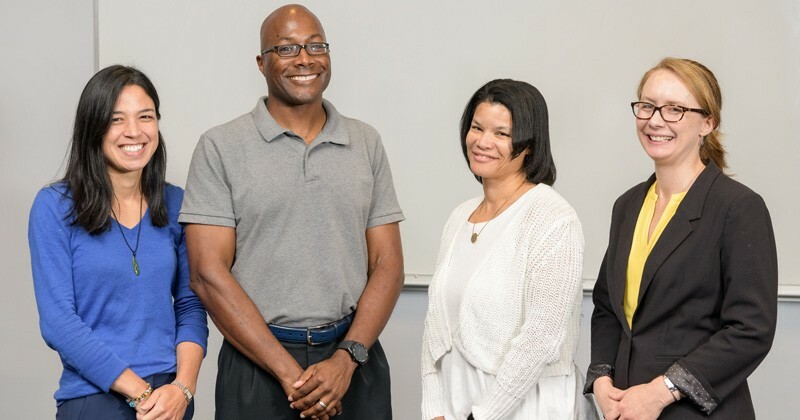 The 2018 Future Faculty Workshop was co-directed by Thomas H. Epps, III, the Thomas and Kipp Gutshall Professor of Chemical and Biomolecular Engineeringwith a joint appointment in materials science and engineering at UD. A recent study of four public land grant universities, published in the journal PLOS One, found that female assistant professors in engineering disciplines are more likely than men to leave their institution without tenure, and engineering professors from underrepresented minorities are more likely than others to exit before their tenth anniversary. 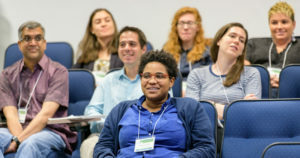 This year’s Future Faculty Workshop was the third one co-directed by Epps. Each year, the program has been evaluated through pre- and post-workshop surveys, follow-up questionnaires, and independent workshop observations in order to continuously optimize its content. The team collaborates with Susan Giancola, associate director of the Center for Research in Education and Social Policy (CRESP) at UD, on these efforts. Chintan Kapadia, a mentee and post-doctoral associate in biomedical engineering at UD, learned helpful tips for increasing his visibility in the field, identifying institutions and departments that would be a good fit for his expertise, starting a research lab and more. April Kloxin, assistant professor of chemical and biomolecular engineering at UD, and Millie Sullivan, Centennial Junior Professor of Chemical and Biomolecular Engineering, also participated as mentors. The 2018 Future Faculty Workshop was primarily supported by NSF Grant #1642025 as well as UD’s College of Engineering, Department of Materials Science and Engineering, Department of Chemical and Biomolecular Engineering, Tosoh, and the Journal of Applied Physics.